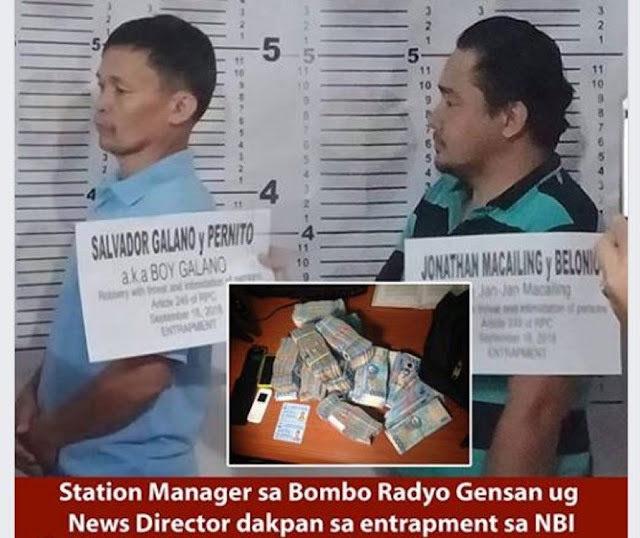 Both station manager and news director from BOMBO RADYO Genaral Santos City arrested from an entrapment operation conducted by the National Bureau of Investigation (NBI). They were identified as Jonathan Macailing and Salvador Galano for extorting P10 million from a local Pastor's business, identified as Pastor Joel Apolinario, founder of local money scheme KAPPA. Apolinario revealed that both radio personalities asked for P400,000 seeking to shut-down the issue. But after a week the identified radio personalities went upon the issue and intentionally asked for P10 million. Apolinario initially gave P5 million as down payment through entrapment operation.